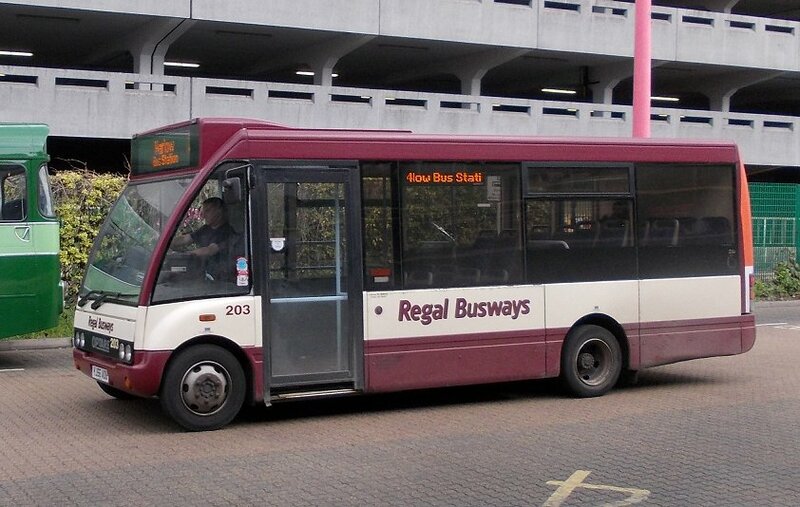 After I alighted from BN45 I walked down the bus station past RMC1507 and RF308. 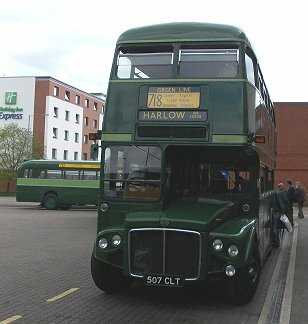 Down on the stands RF600 was loading for a trip on the 390 to Sawbridgeworth. 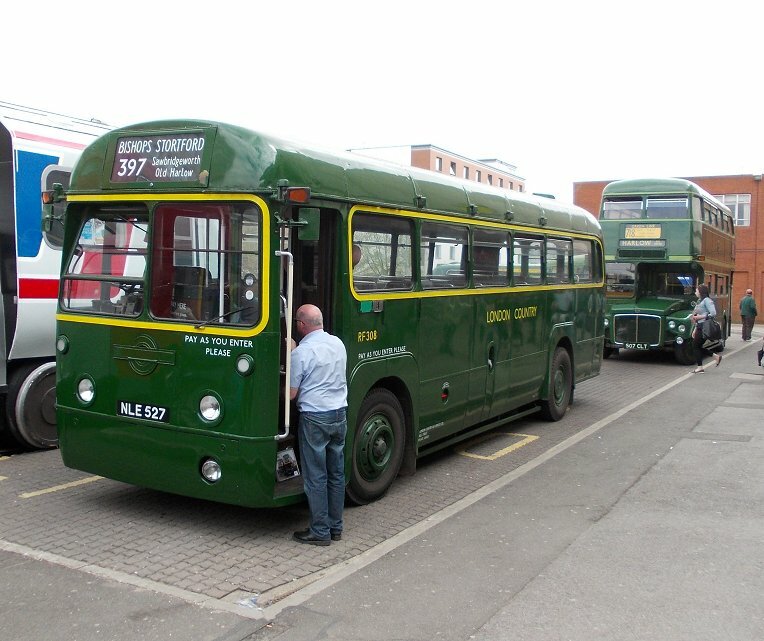 Red RF354 pulled in alongside it to load for the 393. 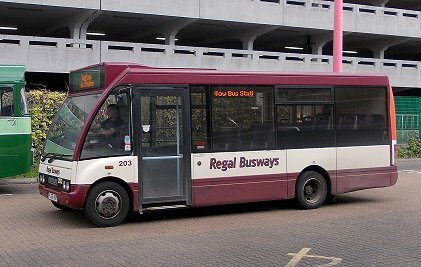 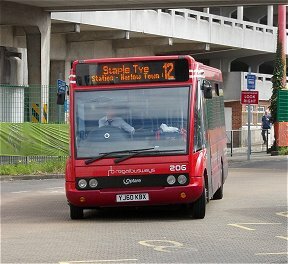 Another of Regal Busways' Solos, 203, purred through the Bus Station on a local Sunday service. 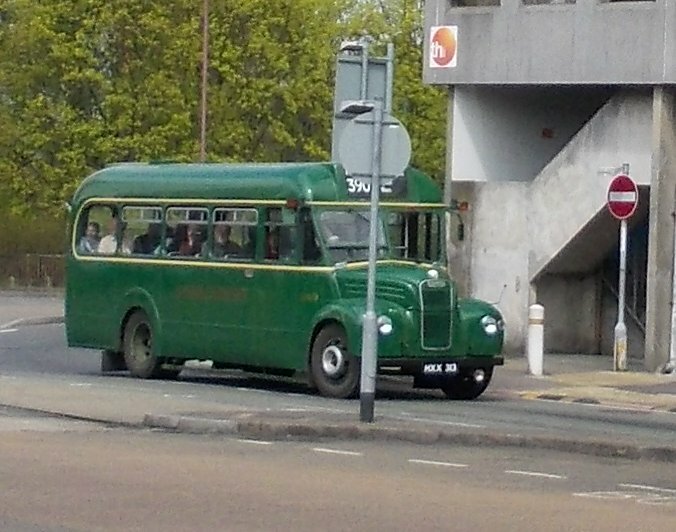 I headed for the shopping centre, and found M&S. They provided me with a sandwich and a drink. 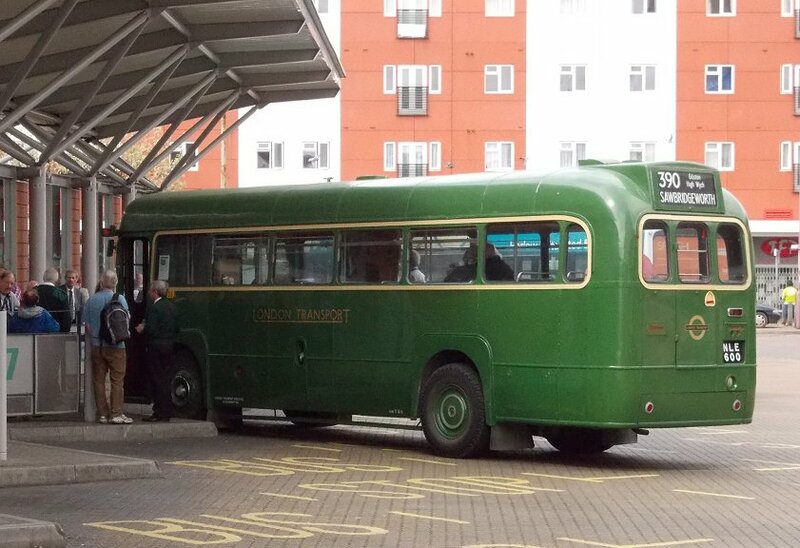 I returned to the bus station in time to glimpse GS13 arriving back from Hertford with a 390. 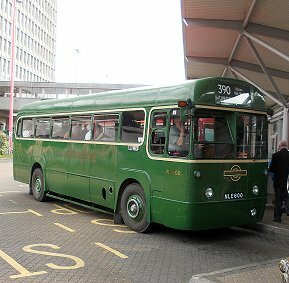 Its modern equivalent, small Solo 206, came bustling under the bridge to load for local route 12. 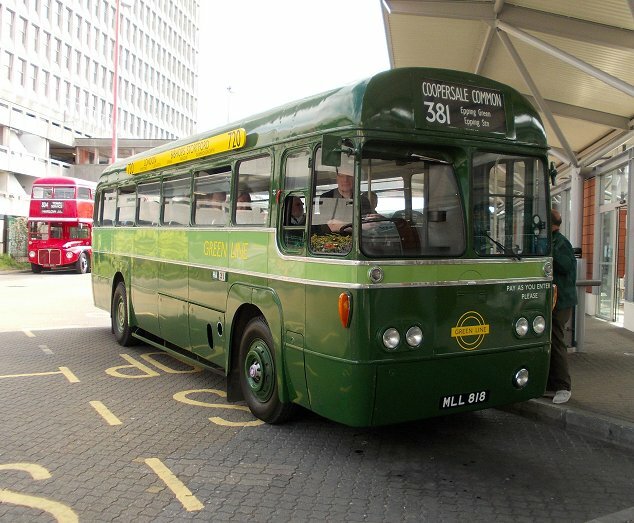 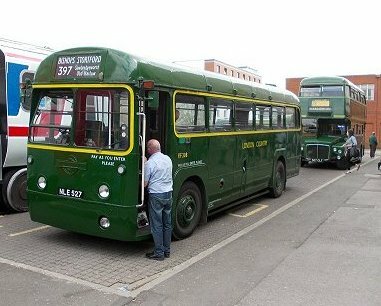 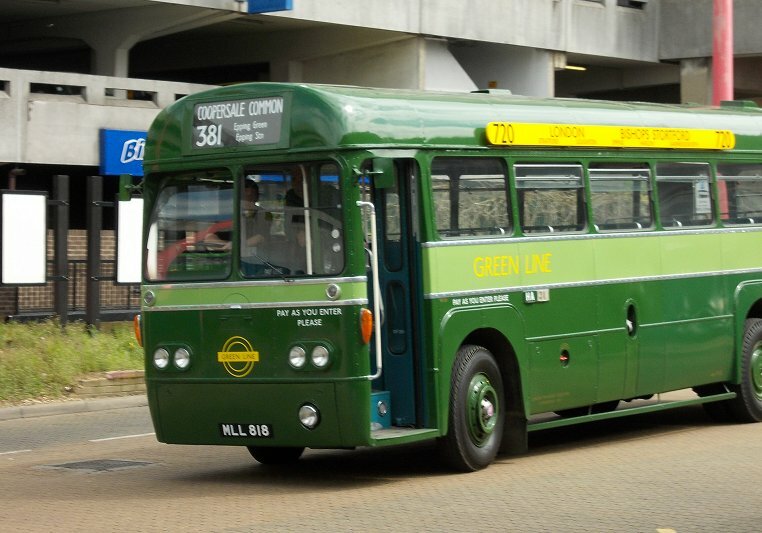 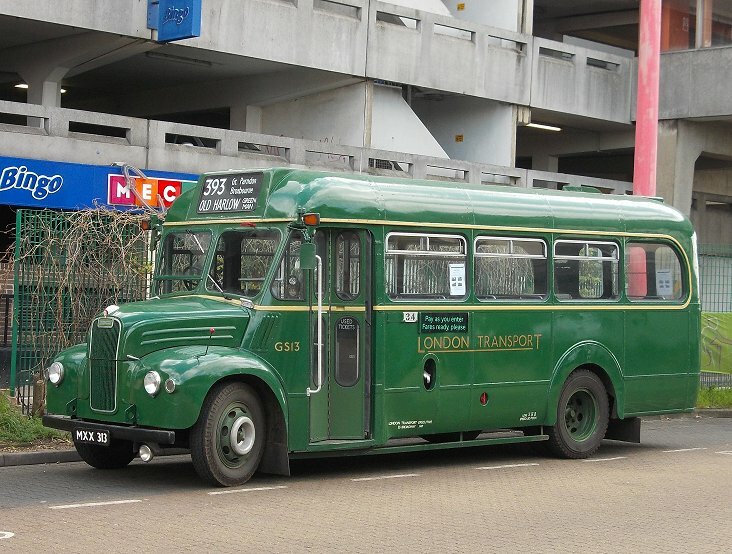 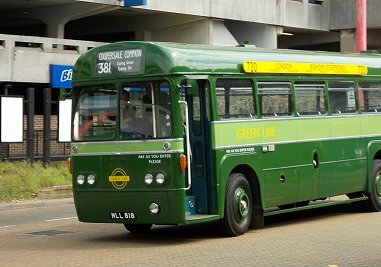 Modernised Green Line RF281, wearing side-boards for the 720, came round onto the stand for the 381 to Coopersale Common. 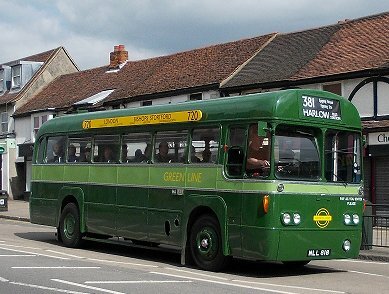 Green Line RFs and crews sometimes worked a local turn at the start or end of a shift. 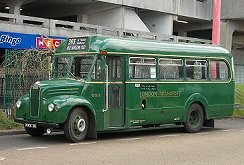 The crew welcomed me aboard, and I enjoyed the luxury of a forward-facing seat at the front - Green Line RFs had these instead of the long bench seats or luggage pens of their bus brethren. 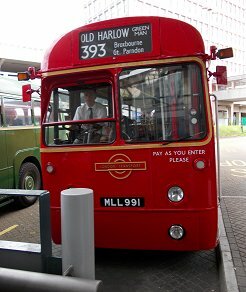 We headed south-west out of Harlow, taking the same route through Great Parndon as the 393 - apart from omitting the Katharines loop. 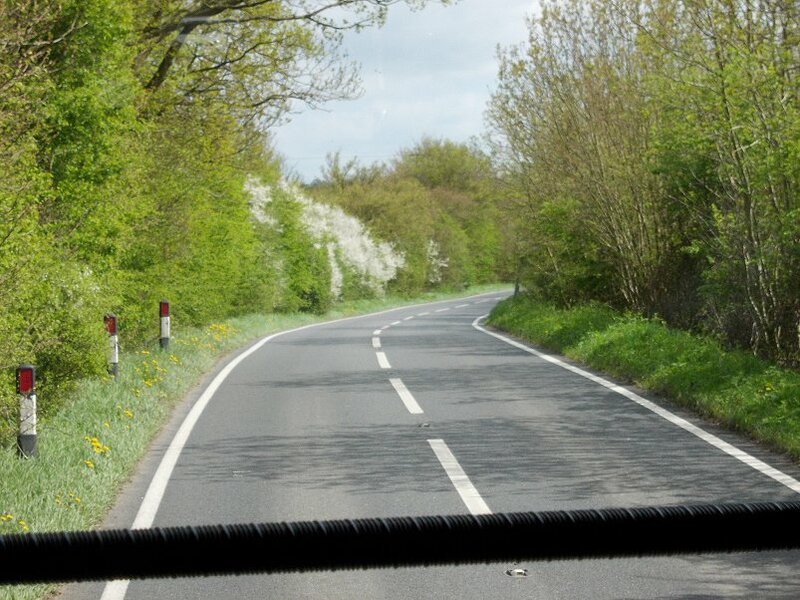 At Tylers Cross we turned left onto Epping Road, a delightful country lane, bursting into fresh green foliage as we passed. It twisted and turned, rose and fell, joining the communities of Broadley Common, Epping Green and Epping Upland. 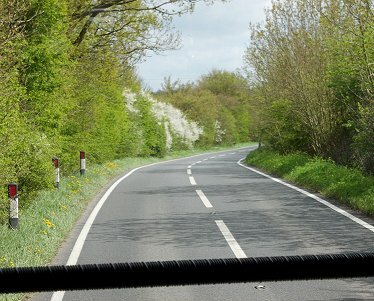 There were extensive views over a wide swaithe of farmland as we headed along the ridge towards Epping, visible on the skyline ahead. 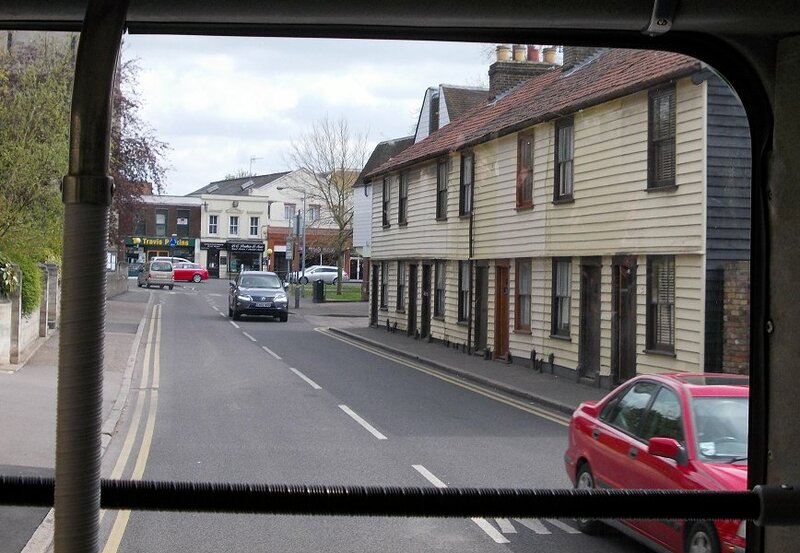 As we entered Epping the route changed from a country back-lane route to an urban back-roads route. We turned right off the "main" road, Lindsey Street, onto Beaconfield Road, and picked our way downhill between the parked cars on this 1960s estate. 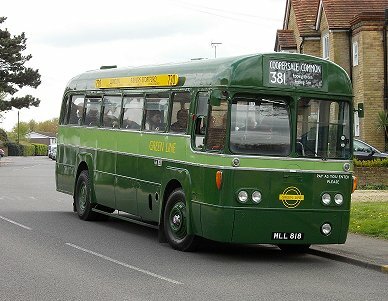 Then it was left up Coronation Hill, and left again to climb St.John's Road up into central Epping. 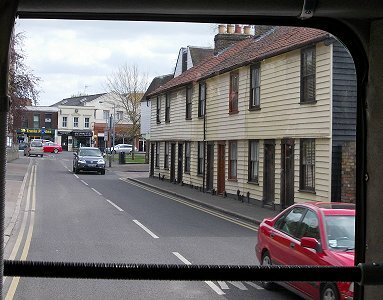 We arrived in Epping High Street beside St John the Baptist Church, and crossed almost straight over into Station Road. 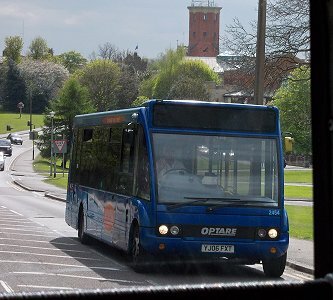 We were summoned to stop at the bus stop just down the hill. We rumbled on down the hill, not turning in to the station, to the surprise of some of passengers, who then scrambled to alight. 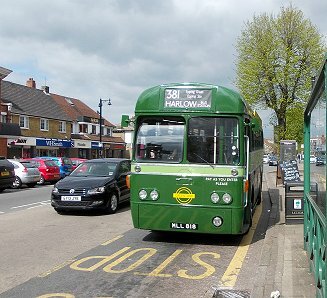 We went on down into the valley bottom, and followed Stewards Green road alongside the stream towards the M11, as far as The Merry Fiddlers. 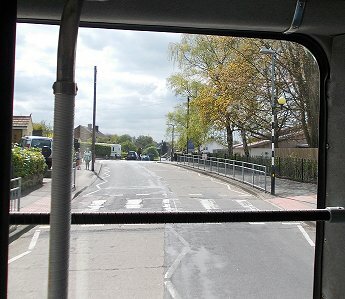 There we turned left up Coopersale Street. 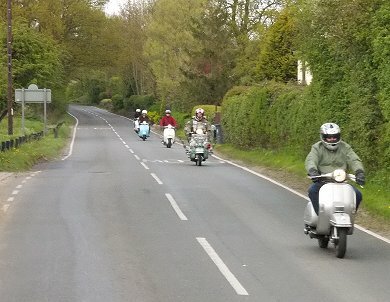 A band of elderly mods on Vespa scotters came pouring down the hill. The Theydon Oak pub seemed to be doing a roaring trade, judging by the number of cars clogging the roads all round it. 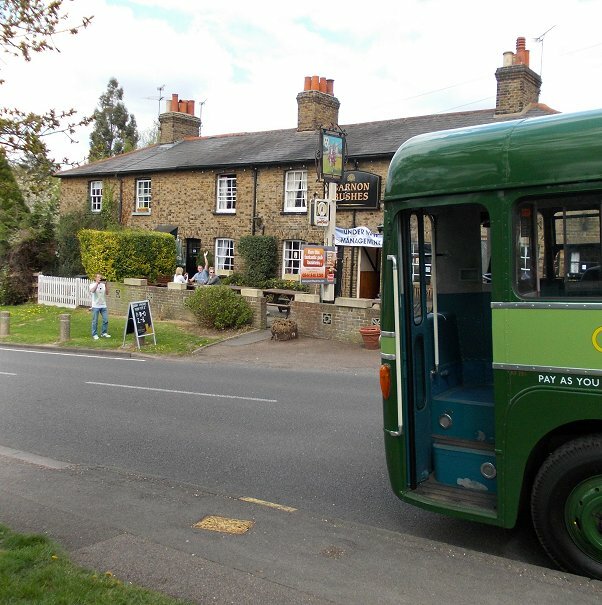 We turned right up Houblons Hill to the village of Coopersale Common, where we drew up opposite the Garnon Bushes public house. 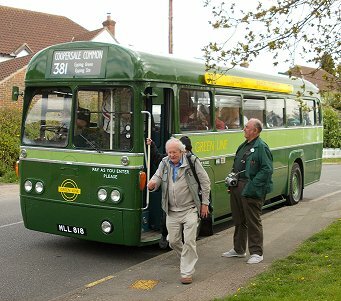 We had a few minutes before our return journey, so we walked over to The Garnon Bushes and chatted with the people outside, who were interested in the bus and what we were doing with it. 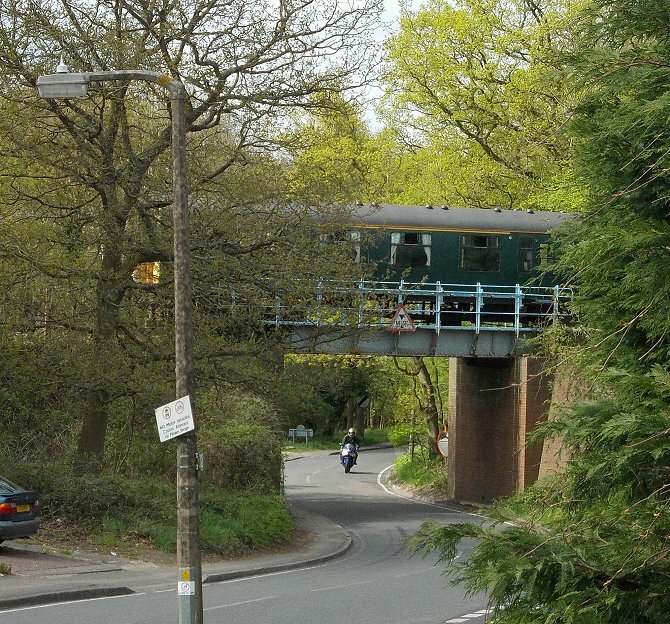 A toot of a railway horn and the thumping sound of a Sulzer diesel engine gave brief warning of an approaching train. 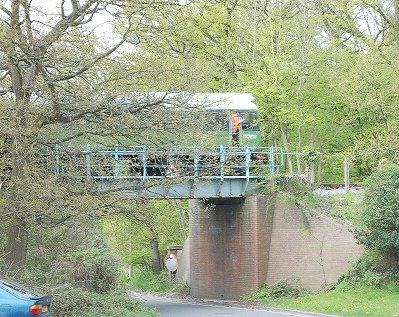 Southern Region 3-CIG No 7423 nosed across the railway bridge just north of the pub, propelled by Derby Sulzer Type 2 D7523. 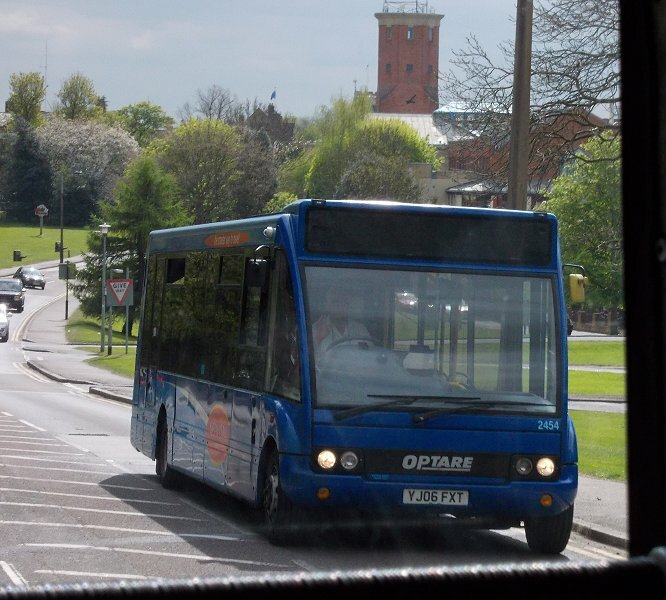 It disappeared up into Epping Forest, towards its terminus just short of Epping Station. 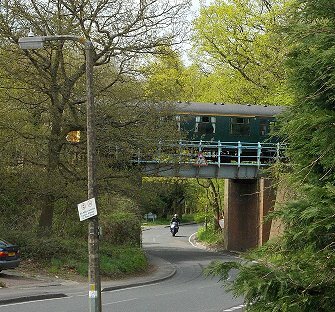 A little while later the Epping-Ongar Railway train came back, well-camouflaged amid the spring foliage. Rather than return vis Stewards Green we were timetabled to go forwards under the railway bridge to meet the Ongar-Epping road in Epping Forest, then back we to eneter Epping from the north. On the way down into the town we met Network Harlow Solo 2454, but I cannot remember whether it was heading for Harlow or Ongar. 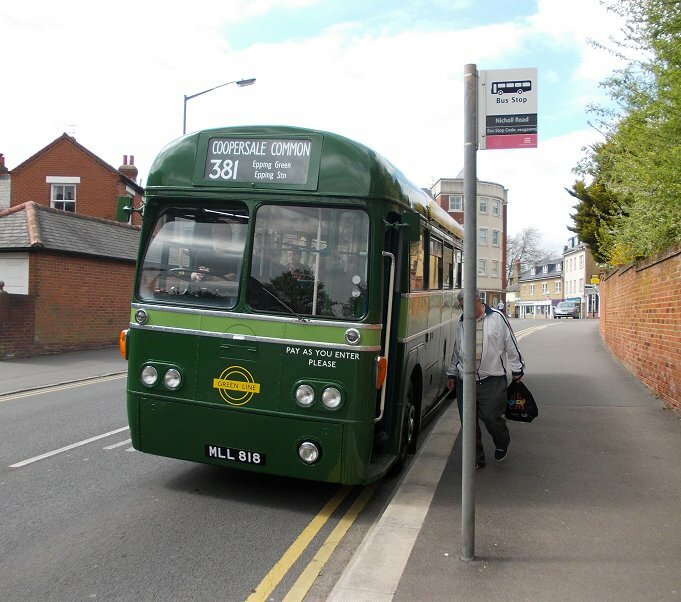 I alighted at Epping Church, and quickly crossed the road to the normal northbound stop. 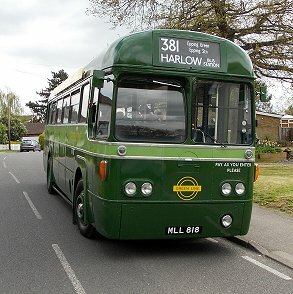 Behind me, RF281 pulled round the corner by Epping Church to set off on its back-roads route to Harlow.